Below is an email that was sent to me from a friend who lives here in Pennsylvania but is originally from the country of India. He brings a unique perspective to everyone he meets because he has not only seen but lived in a country where opportunities are limited. Many Americans do not realize the opportunities afforded us here in America. I wanted to share this email to give you a first hand perspective of those less fortunate. I returned from a week-long trip to India. I spent a week in New Dehli – India’s capital, where I was visiting my family. I just wanted to share with you an image that never ceases to disrupt my sense of reality. 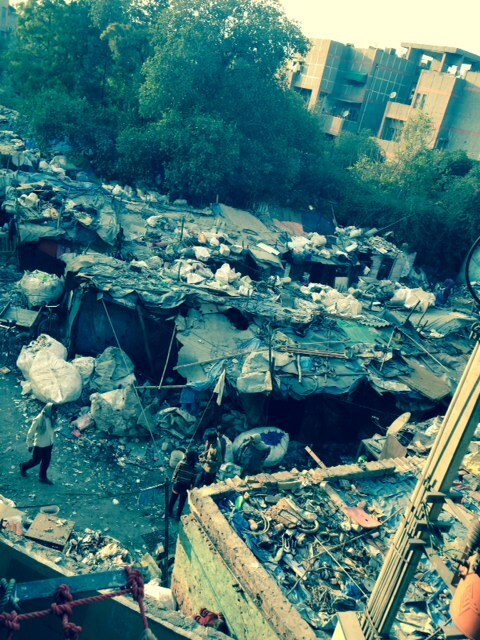 The attached is a picture of a slum behind my father’s home. Let me describe it briefly. It is a slum comprised of the lowest caste of Hindus–you may know them as “untouchables.” They are in the trash collection “business” and unfortunately end up living in the midst of it. As a result of cultural stigma, and little opportunity to work themselves to a higher station in life they end up in these dire circumstances. Their life expectancy averages 45 years of age–most of them end up dying by a more lethal form of tuberculosis. In the midst of this mess was a child who might have been 3 or 4 years of age who smiled and waved at me. While this sign of life in the midst of poverty and death brought me great joy, it also made me think about her life. Knowing that she had few, if any prospects to make her way out of poverty, made this whole scene that much more dreary. Let me be clear: the people in the slum do not lack ambition, and are not less able than the average person. There are simply fewer outlets that allow their ambitions and abilities to be realized. For every one that goes on to prosper, there are millions that continue to languish in such squalor. These scenes are common across India. This is one reason I fight: to show the world that ideas matter. Ideas that respect the individuality and liberty of the person are critical to human flourishing. Ideas that promote free markets and limited government allow people to pursue their dreams and ambitions and, on their own, become productive and empowered citizens. I’m glad to be back and fight with you and many others. (Disclaimer: I was more optimistic about India this time because a lot had, indeed, changed. No surprise to me though that lower taxes in the city of Delhi, and weeding out corruption coincided with it). Abhi Samuel, a native of India is the Commonwealth Foundation’s Director of Entrepreneur Engagement. There are a few defining moments in our lives that make all the difference. Many of these moments come from crucial or breakthrough conversations with important people in emotionally charged situations where the decisions made take us down one of several roads, each of which leads us to an entirely different destination. When a challenge in life is met by a response that is equal to it you have success. Just as the world is changing at a frightening speed, so have the stresses and pressures we experience. This makes it all the more imperative that we nourish our relationships, and develop tools, skills and enhanced capacity to find new and better solutions to our problems. 25 years of research with 20,000 people and hundreds of organizations, by Patterson, Grenny, McMillan, and Switler have proven that individuals who are the most influential, who can get things done and at the same time build on relationships are those who master their crucial conversations. Crucial conversations create an entirely new level of bonding. They transform people and relationships. Not a compromise between two opposites but a higher middle way, like the apex of a triangle. Because two or more people have created something new from genuine dialogue, bonding takes place just like the bonding that takes place in a family when a new child is created. When you produce something with another person that is truly creative it’s one of the most powerful forms of bonding there is. Crucial conversations are interactions that happen to everyone. They’re the day-to-day conversations that affect your life. What makes one of the conversations crucial as opposed to one that is not? What makes each of these conversations crucial? It’s that the results could have a huge impact on the quality of your life. By definition, crucial conversations are about tough issues and were masters at avoiding tough conversations. If you know how to handle and even master crucial conversations, you can step up and effectively hold tough conversations about virtually any topic. I recently spoke for the State of Pennsylvania Department of Corrections to educators from various state correctional institutions in the Northeast. The discussion centered around the impact educators can have in improving the recidivism rates of inmates leaving these institutions after incarceration. Pennsylvania Department of Corrections 2013 Recidivism Report indicates recidivism rates have remained virtually unchanged over at least the past decade in Pennsylvania. Approximately 6 in 10 released inmates are rearrested or re-incarcerated within three years of release from prison. Younger released inmates are more likely to recidivate than older inmates. A released inmate who is under 21 at the time of release from prison is more than twice as likely to recidivate within three years than a released inmate who is over age 50. The current Pennsylvania budget at 2 Billion dollars is HUGE. In Pennsylvania it costs approximately $35,697 apiece to house the state’s 51,321 prisoners a year. That’s more than it costs a family to raise a child annually. National statistics are no better. In fact other states’ recidivism rates were last updated in a 2002 report generated by the Bureau of Justice Statistics. In that report an estimated 67.5% of prisoners released in 1994 were rearrested within 3 years, an increase over the 62.5% found for those released in 1983. This means in the last 30 years that 2/3 of the inmates released returned to prison, and that there has not been any improvement despite the billions of dollars spent in education and rehabilitation of inmates. Imagine going to a business and 2/3 of the time it failed to meet its’ objective? They would be out of business, but not a government institution. Whether it is the Department of Corrections or the Department of Education the reply always seems to be the same. Not enough funding. We cannot continue to justify spending the taxpayer’s hard earned income on more and more on programs when they continue to fail. What do they say the definition of insanity is; continuing to do the same thing expecting different results? In speaking with officials in the education sector of the Dept of Corrections they indicated there are plenty of programs that provide adequate education for inmates to receive training and certifications that allow them to obtain employment. Numerous employers large and small have been willing to give former inmates employment. But too many times the employers have been disappointed after hiring an inmate over another qualified unemployed individual and investing money into hiring and training only to have them quit or be fired for a character issue; not being on time, not showing up, disrespecting the job or rules of employment, etc., not for being unable to perform the functions of the job. This begs to ask the question; are we perhaps not focusing on a key area, life skills issues that we all need to survive on the job. In fact life skills issues are skills we need to survive and thrive in all areas of our personal lives. One example of success in accomplishing lower recidivism rates is Oklahoma who has one of the lowest rates in the nation at 28 percent. The low rate is a result in part of a pilot program the DOC had for inmates from Oklahoma County. The program places great emphasis on an inmate’s re-entry into society, by providing the knowledge and skills necessary to successfully rejoin the community. John Wentzel Secretary of the Pennsylvania DOC said without any corresponding attempt to reduce the number of people sent to prison through investment in evidence-based policies, addiction treatment and community re-entry programs, the budget will continue to go up. I believe education is one of those community re-entry programs. But what education should we provide? What is the mindset and what are the skill sets needed for an individual to succeed? Let’s address first the question what does an individual’s mindset have to do with it? I believe everything! Sports coaches and athletes understand the role a proper mindset has to do with success in the sports arena. Research has demonstrated the correlation between the mindset of a patient and the outcome of a surgery or illness. Employers hire more and more on attitude knowing they can train a motivated employee. In leadership we understand that the Actions we take are based on the Information we have in our lives and those Actions determine Results.